NZ underground hip hop and trap is thriving right now. We glowing at Valhalla on Friday the 13th of July. We got Bay1 pulling up with the homie Rvnnah to play some of their trademark candyfloss infused alt trap, that'll send you kisses thru the airwaves. 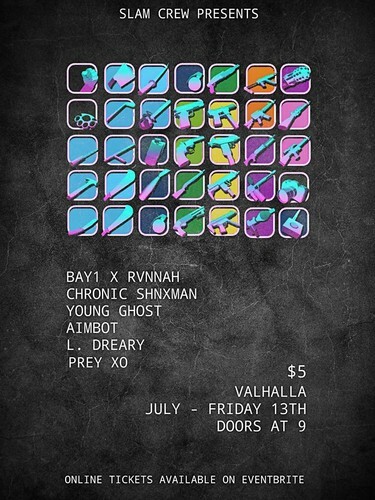 Chronic Shnxman, Wellington's own angsty trapper is playing a set fueled by Satan, drugs and getting as lit as possible. Finna rock your dome. Young ghost gonna bring his crazy lit, gritty britty grime/trap crossover vibe to the stage with hard beats and faster words than an auctioneer on meth. Aimbot teaming to slay with his thought-provoking and ruthless bars with hard as beats by sick local Wellington producers too. L. Dreary is bringing his sad, provocative alt hip hop to life for the first time ever and he is looking to bring angry tears to your eyes while simultaneously turning up. We are lucky to have sadboy/Black Metal Warhorse Prey XO opening this joint for us with his abrasive and scathingly honest blackened trap vibe. Make sure you show up early to support. You don't want to miss this show.